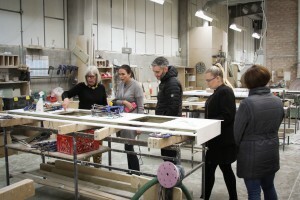 Corian Training – we support all of our customers by offering full training for Corian and other solid surface. 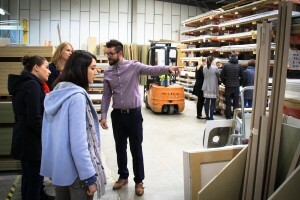 As one of our customers, we will invite your staff to come to the factory, or alternatively come to your showroom and present directly to your team. 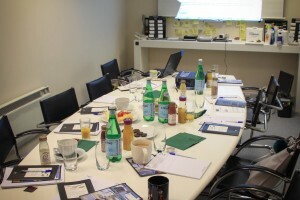 We offer training to small groups between two and eight designers. This gives everyone the opportunity to ask questions and fill the gaps in their knowledge. We will give your team the confidence to deal with customers questions. This will help them achieve a greater understanding product enabling them to sell the product easier. Find out how Corian is made and how the material can be used to achieve your customers designs. 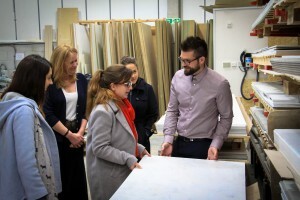 We will show you around the factory to see first hand how we manufacture solid surface worktops. We demonstrate the skill and attention to detail that we put into each and every bespoke item that we make for you. You even get a chance to have a go yourself at some thermoforming! With hundreds of combined years of experience, many of our fabricators have been with the company for years. Our depth of experience and knowledge is one of our key strengths. We finish the training with a practical demonstration of how to clean Corian and hopefully tackle some of the myths surrounding the material. Cleaning is one of our most popular FAQ’s. When the designers see the cleaning process, they have no doubt that cleaning will never be an issue. Our intention is that all our designers have a thorough knowledge of how we manufacture their designs. Hopefully we can inspire them in a little way to try something new! If you are a studio looking to sell Corian or any other solid surface and would like more info on attending one of our FREE training courses, please call us or contact us here.